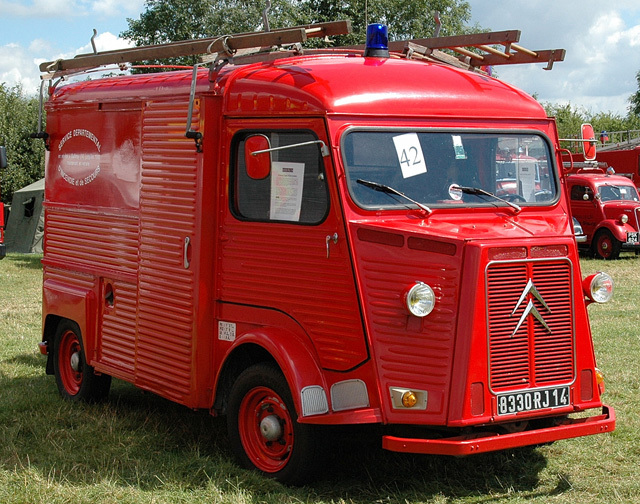 The Citroën H van is a typical French design. This one is from the early 1950 and served in the Normandy village of Balleroy until 1993. This was the first responding appliance of the brigade. It carried first aid fire fighting equipment, rescue gear and ladders. "H" van's had split screen's till the late 50's. This one has the later one piece screen. Need to check your dates. But it's still a nice pic of an iconic French workhorse. Added by Richard Simpson on 27 September 2010. Thanks Archie for this mythical van. The "one piece screen" was introduced due to manufacturing costs. Added by Jacques PETER on 29 September 2010.